In fact, as stated by Taco Bell themselves, three-quarters of the menu is under 500 calories. Your favorites can also be made healthier with their “Fresco style,” which substitutes fresh pico de gallo in place of cheese, sour cream, mayo-based sauces, and guac. So despite your New Year's resolutions to eat healthier, you can still happily coexist with Taco Bell. 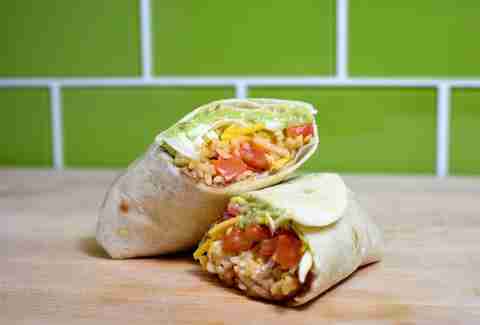 Here are eight healthier Taco Bell options next time you want to live mas. Veggies! Power! The goodness in this bowl is already in the name. As Taco Bell likes to describe it, “the power-up boost you get from the bowl is so similar to a power-up in a video game.” The Veggie Power Menu Bowl contains rice, black beans, cheese, romaine lettuce (see, vegetables), guacamole, pico de gallo, and creamy avocado ranch sauce. Skip the sour cream if you want to reduce fat and add a scoop of steak or chicken if you’re in need of some extra protein. 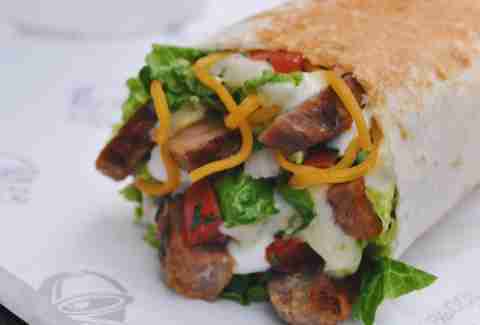 The Power Menu Burrito is like all the goodness of the Power Menu Bowl sans rice and wrapped up in a toasty tortilla. It’s like having a handheld version of the bowl -- so you can eat it on the go because you are a health machine with places to be -- with an addition of tasty grilled chicken. Apparently, the burrito was also “forged by a powerful wizard” and gives the holder “crazy energy and the capacity to achieve things that no mortal human could achieve, like do a bunch of push-ups and go through an entire day without wanting to take a nap.” Seems a bit far-fetched, Taco Bell, but we’ll take it. 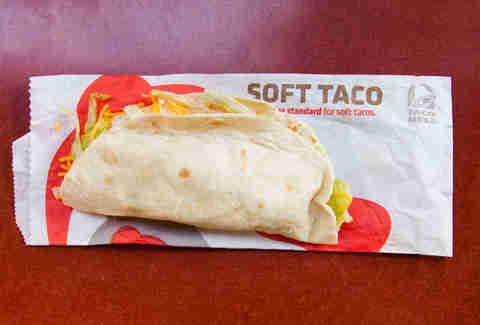 Chicken soft tacos are like the chicken noodle soup of the fast food world: reliable, comforting, and always tasty. 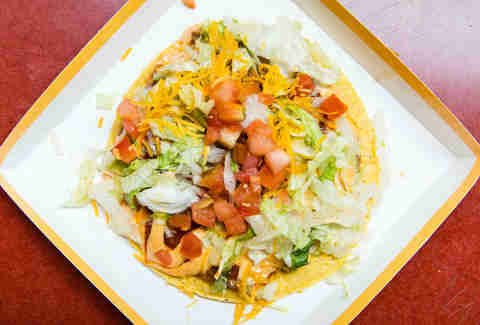 Taco Bell’s, when created “fresco style”, rings in at a mere 150 calories with 9 grams of protein. Slather on some hot sauce and make your soft taco dreams come true. Beans, beans, they’re good for your heart. 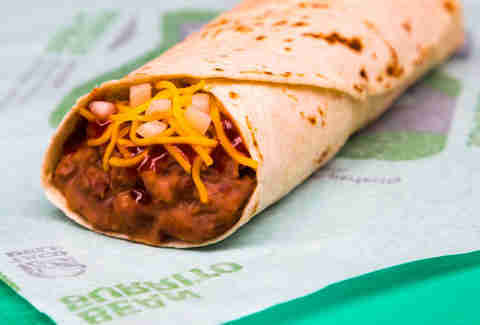 That’s why you shouldn’t hesitate to order Taco Bell’s bean burrito. It clocks in at 380 calories with 9 grams of fiber and 14 grams of protein. Replace the added red sauce with pico de gallo to further reduce your sodium intake and up your vegetable consumption. Breakfast on the go doesn’t have to be complicated, expensive, or filled with greasy hash browns. 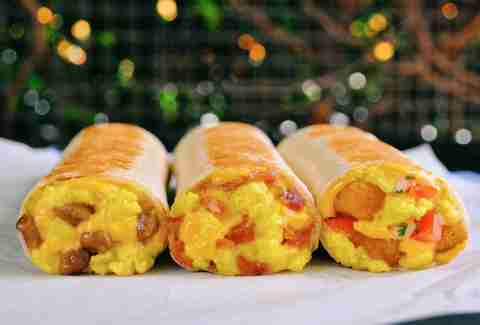 Taco Bell’s grilled breakfast burrito is under 350 calories and boasts 10 grams of protein, making it a satisfying, fulfilling start to your day. And at just a dollar off of Taco Bell’s dollar cravings menu, this burrito definitely gives you serious nutritional bang for your buck. Honestly, any menu item from Taco Bell can be made more nutritious by making it “fresco style.” It’s like a not-so-secret life hack to having Taco Bell that’s still delicious but with a lot less fat. 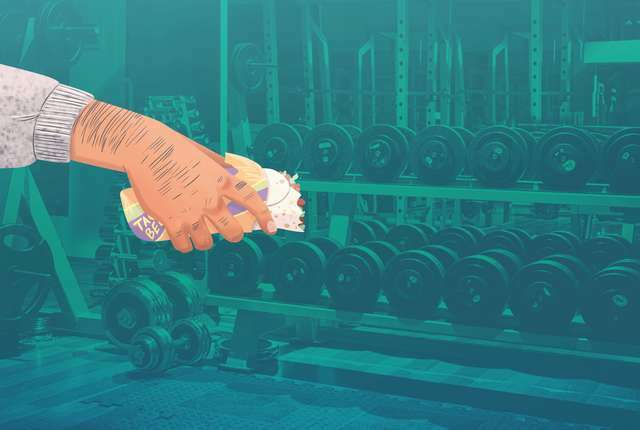 The same applies to their 7-layer burrito; when made fresco style, the entire thing comes out to 340 calories with 6 grams of fiber, 10 grams of protein, and only 2.5 grams of saturated fat. We don’t know if the fresco style messes with the alleged seven layers but honestly we don’t care. This spicy tostada gives you the crunch you crave from a visit to Taco Bell without all the extra calories (and dusty Dorito fingers). At just 210 calories, with 5 grams of fiber and 6 grams of protein, the spicy tostada is a great, more nutritious alternative to other crunchy tacos (plus it’s off the dollar cravings menu too, so feel free to go crazy and order two). 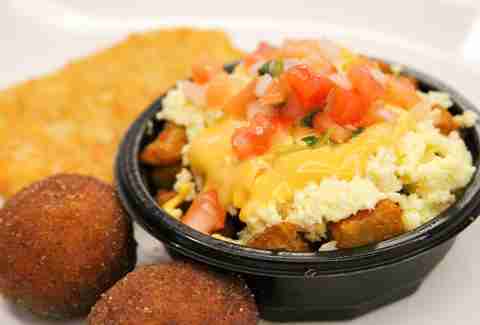 The mini-skillet bowl is another great breakfast option from Taco Bell. The eggs provide 5 grams of lean protein and the potatoes pack enough heft to satisfy your hunger until lunch rolls around. Skip the nacho cheese sauce to reduce your sodium and fat intake and start the morning off right -- for just a dollar. Kat Thompson is a staff food writer at Thrillist. Her favorite thing to order at Taco Bell is a Crunchwrap Supreme, which may not be the healthiest option, but is certainly the tastiest. Follow her on twitter @katthompsonn.